Authentic, home-made pasta; a cosy and rustic interior; wines, ingredients and recipes from Italy itself… What more could you ask for when you’re seeking a true-blue experience to have a taste of Italy without travelling all the way to the country itself? When we first stepped into Pasta Bar, we were struck by how cosy and intimate it was. 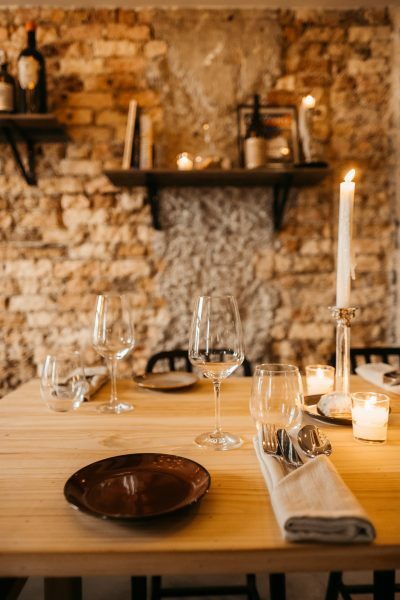 With an 18-seater open kitchen bar-counter, and tables for up to just 16 additional diners available, this would make the perfect place for a romantic date night, or anniversary dinner. For diners who enjoy watching their meals being crafted together from individual ingredients, do opt for the bar seats! 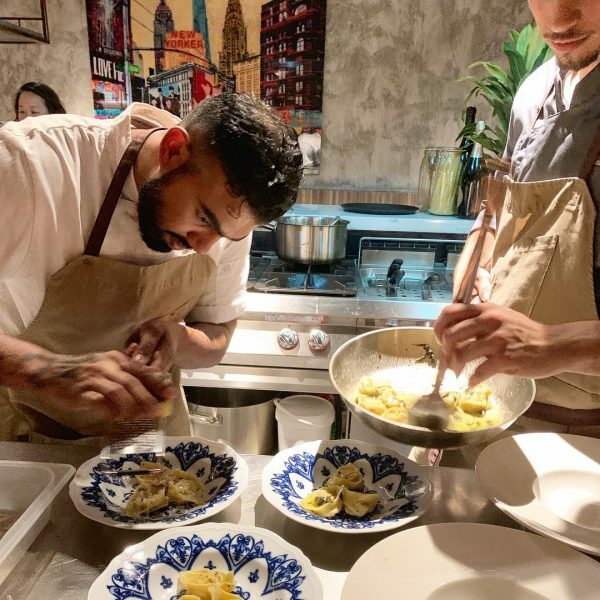 They offer a wonderful view of the talented chefs going about their craft, among them the friendly Chef Alessandro Giustetti, who hails from Genova, and helms the kitchen. 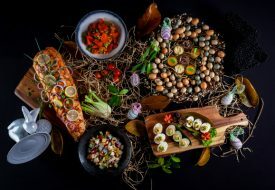 Chef Alessandro and his team animate the open kitchen with unique creative flair, treating diners at the bar-counter to a mesmerising spectacle of kneading, tossing and artistic plating. Another way Pasta Bar differentiates itself is through said dish – they offer a whopping eleven different pastas, all hand-made fresh in-house! Made using specialist techniques and principle ingredients – a selection of semolina and ‘00’ flours, whole egg, egg yolks and water – we knew we had to try their pasta! We started off our meal with a glass of super Tuscan red wine, as well as a curated selection of antipasti: Arrosticini ($19) – grilled lamb skewers served from a terracotta pot alongside rosemary infused olive oil, sea salt and lamb jus; Burrata with Pesto “Genovese”; and Veal Tongue served with pickled vegetables and salsa verde ($24). The smooth, spicy warmth of the red wine paired well with the meat dishes, and we especially liked the arrosticini, which was not gamey at all, and instead delightfully more-ish. The pesto too, was fragrant and complemented the creaminess of the burrata. 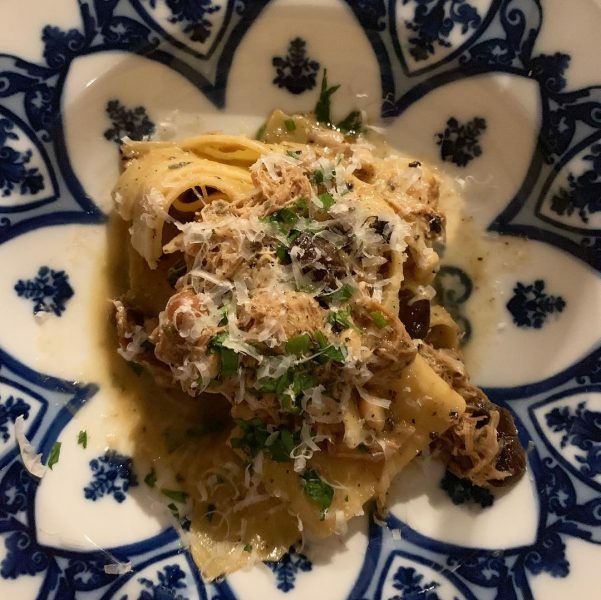 The first pasta dish we tried was the Pappardelle with Rabbit Ragu ($30)- an interesting choice for those who are adventurous! We loved the al dente texture of the pappardelle – pasta-lovers would definitely be able to tell the difference between Pasta Bar’s fresh and hand-made pasta, and normal store-bought pasta. 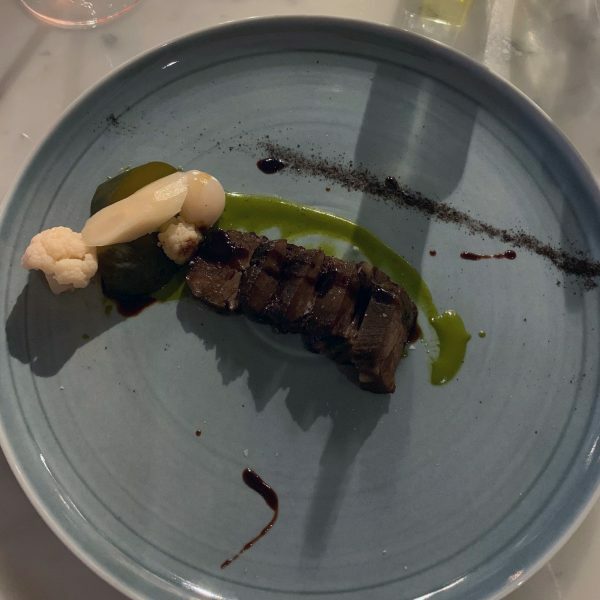 Our only quibble would be that the ragu was too salty, but otherwise, we liked the fragrance the pine nuts brought to the dish, as well as the wonderful tenderness of the meat. 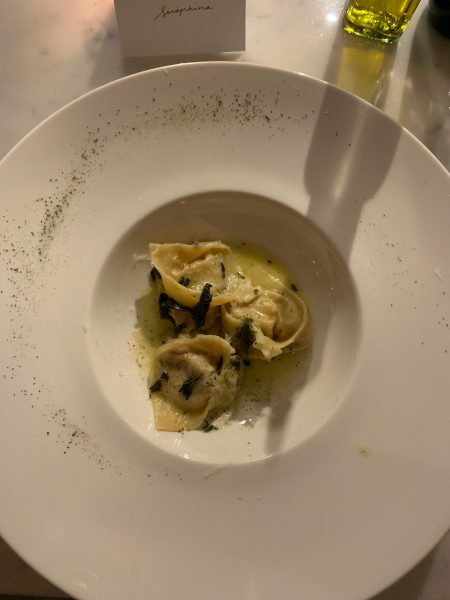 Our pick for the pasta dishes would likely be the Tortelli ($26), generously stuffed with pumpkin, and drizzled with a sage and amaretti sauce. Despite being a meatless dish, we are sure that meat-lovers will not miss out on anything by ordering this dish: the pumpkin filling was delicious and naturally sweet, with a tinge of sage, while the sauce was so very aromatic and left us wanting more! 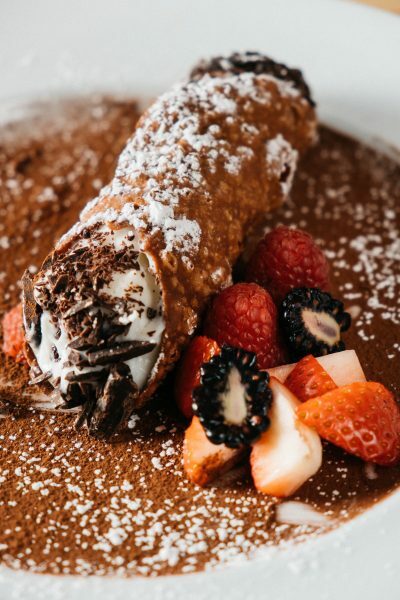 We ended off our meal on a sweet note with the Sicilian Cannolo ($14), filled with sheep’s milk ricotta and dressed with chocolate chips, fresh berries and cocoa powder. Despite its appearance, the cannolo was not too sweet or rich, with the ricotta pairing well with the crisp outer layer. Dining at Pasta Bar was a wonderful, delicious experience. With a wide selection of pastas, a cosy atmosphere, and delicious food; you are sure to have an authentic Italian experience here! For reservations, email mangia@pastabar.sg or call +65 6222 0627. Opening hours: Sunday – Saturday, 6pm to 11pm.